This is the best oven fried chicken I've ever made, hands down. The buttermilk marinade makes for deliciously juicy chicken and comes out crispy every time. Calories 294; Fat 8.5 g; Saturated fat 2.5 g; Cholesterol 182 mg; Carbohydrate 12 g; Fiber 1 g; Protein 41 g; Sugars 2 g; Sodium 709 mg. 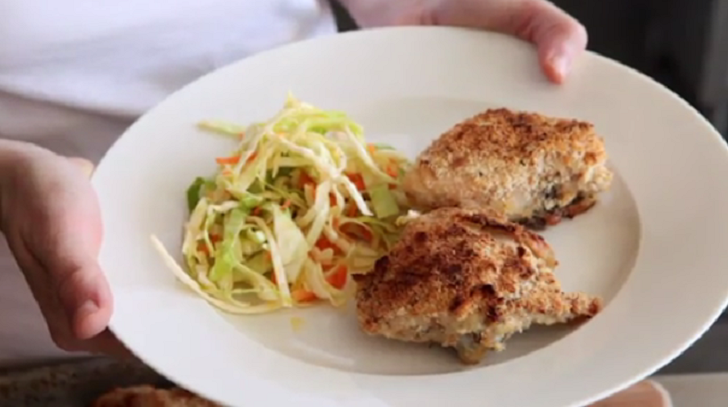 This is a crispy, crunchy, very tasty and moist chicken. I was looking for something to replace take out the chicken at our house. I was extremely pleased with this recipe and my husband loved it and asked me to make it again. "A Keeper." Preheat Oven 350°F: In a baking pan, whisk together flour, garlic pepper, sugar, and paprika. In a medium-size bowl, whisk together buttermilk, eggs, baking powder, and baking soda until smooth. Roll in flour mixture and then dip into buttermilk and flour mixture a second time. Place in baking pan and drizzle with olive oil. Bake about 50-55 minutes or until chicken is golden.